We make the fudges ourselves with butter and cream. Lots of different flavours to choose. The wedding favour range includes foil-wrapped chocolate hearts, champagne cork chocolates and sugared almonds. Our chocolates and fudges are a lovely and speedy way to say, thank you. Best quality Belgian chocolates and truffles, individually packed to order, guaranteed fresh and delicious. 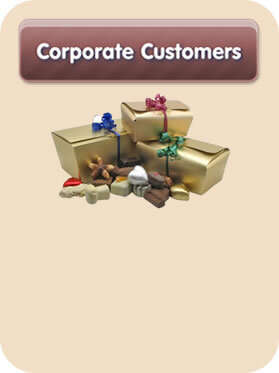 You can choose which chocolates to have in your box. We have a policy of encouraging social responsibility through the use of minimum but beautiful packaging, fair trade and recycling. No order too big or small * Urgent orders welcomed * Branded boxes * Printed ribbons * Friendly, helpful service. We supply both blue-chip companies and small businesses. Let us know your requirement and you'll receive a quote without delay.